"As a youngster I would cycle for miles to sit and watch horses in a field. 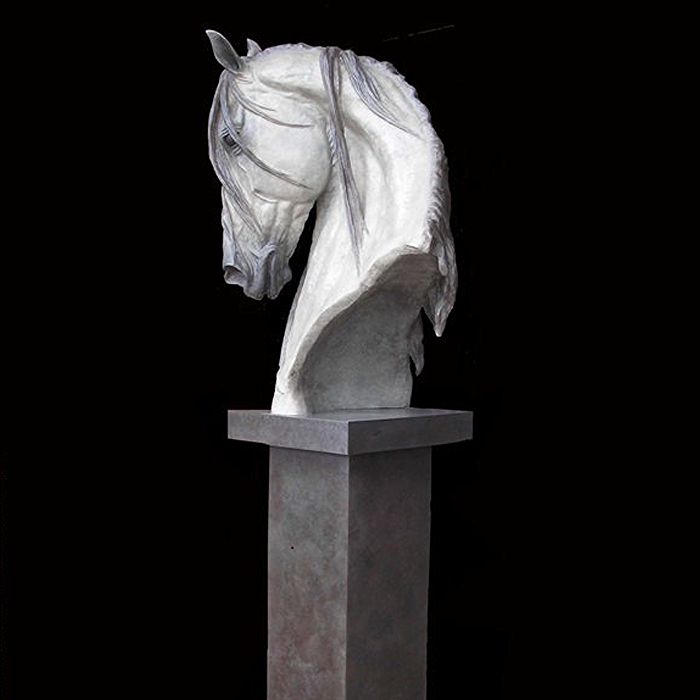 Horses are a lifelong passion and a perfect subject for my sculpture. I love to take the lines, shapes, grace and strength of the animal, to create a piece of art. I want to make art of tactile form; where muscles look like they will tense and flex; where the skeletal form can supply the mechanics of movement. I believe correctness should not be sacrificed to produce great contemporary sculpture. I use my years of knowledge, to combine grace and style with exciting patinas to make something which is current and can be universally enjoyed." Continuing my fascination with the contortions animals adopt just to have a good scratch. This is one of my newest pieces, and part of a number of more contemporary sculptures I have planned. 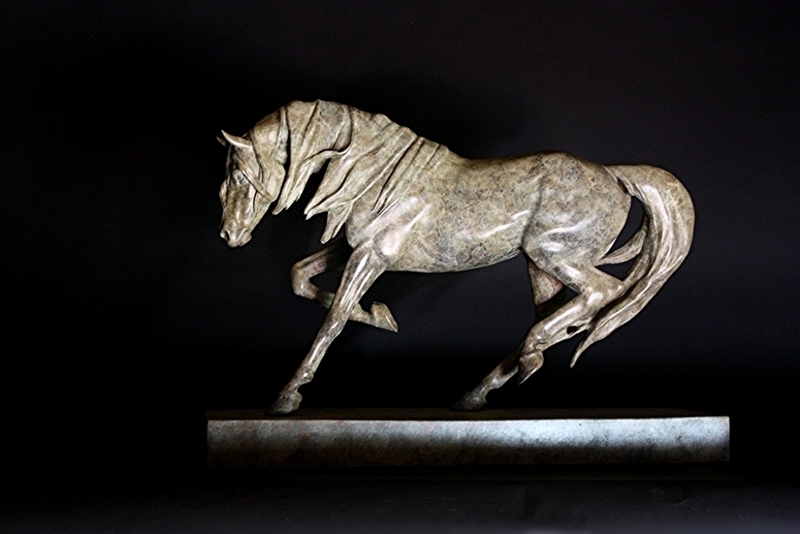 Trying to portray all the power, grace and feel that epitomise the horse for me, in slightly more simplified style. A fabulous contemporary patina is the final touch. Nothing combines power with grace like the horse. One of my favourite thing s to do is a head study. You can portray so much just from the expression and attitude. The Iberian or Spanish breeds are an so distinctive and sculptural. I also love to use a long mane to add movement and focus the eye. A thoroughbred mare follows her foal. I have bred a number of foals and I love to watch them. The concern of the mare for its new born gets steadily less as the foal gets older, but if there’s anything out of the ordinary....she’s there. I hope this sculpture tells that story. The legendary wild horse of North America. Horses rear in shows of dominance and also play. It can make a stunning subject. 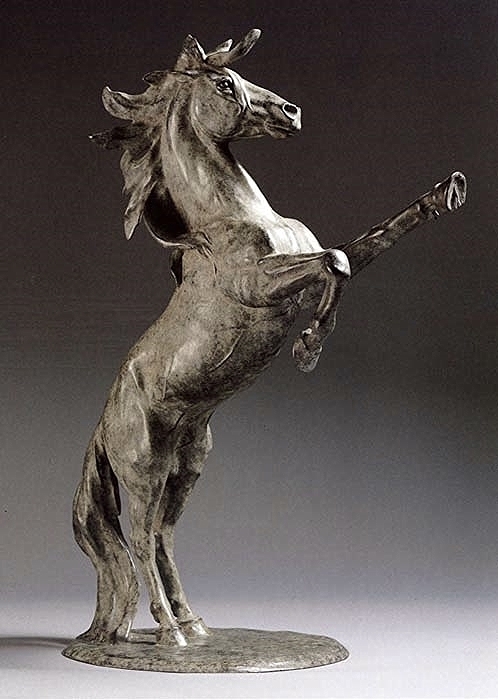 If you look at a lot of older horse bronzes, the horse is portrayed in a very romanticized way. This is my homage to that style. The phenomenal racehorse of the 21st century, the only horse to win The 2000 Guineas, Epsom Derby, and Prix de l'Arc de Triompe in the same year. Horses have a very ordered social structure, which sometimes is challenged. All the interaction both passive and aggressive I find interesting. Sometimes when you watch a horse scratching you wonder how they can stay upright! A scenario many people with horses and other animals will recognise. A scenario many people with horses and other animals will recognise. Horses are often playful in this situation, but completely shocked and spooked, when the tables are turned.